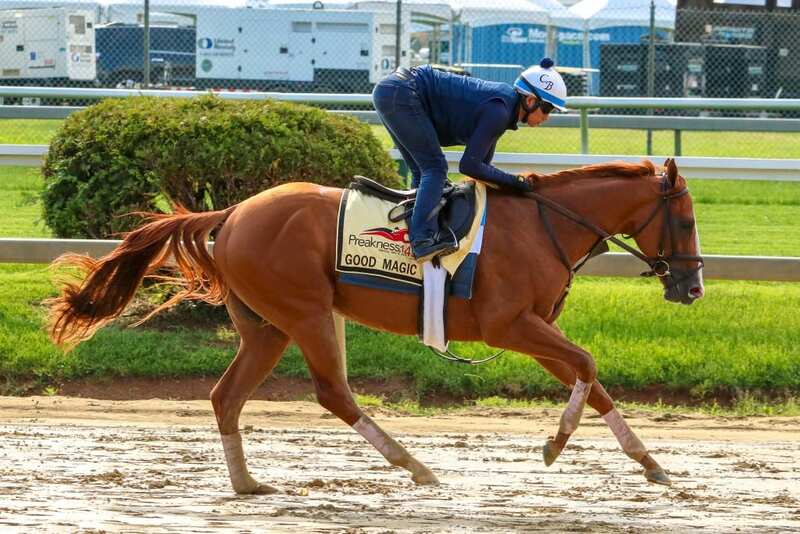 In our Preakness profiles, we look into each of Saturday’s Preakness contenders. The Chad Brown-trained Good Magic won just once as a juvenile, but that lone victory came in the Grade 1 Breeders’ Cup Juvenile — in which he scored by over four lengths — and was enough to secure him an Eclipse Award as top two-year-old. He also owns but a single win to date as a sophomore, that coming in the Grade 2 Blue Grass. He ran a game race to be second in the Kentucky Derby without ever really threatening the winner. The son of Curlin cost a cool $1 million at auction. “I would rather it be a dry track,” Brown said by phone Tuesday afternoon. “He’s proven he can handle the off track at Churchill fine, but I don’t know, I just feel like a drier track would be a fairer situation for everyone involved. It’s hard to say how the race will set up until they draw posts and such. It will be just fine if it’s an off track, but it would be my preference that the track be dry. This will be the fourth consecutive year that the top two finishers in the Kentucky Derby have a rematch in the Preakness. In each of the last two years, the Derby runner-up finished ahead of the Derby winner in the Preakness. With more early speed types entered in the second jewel of the Triple Crown compared to the KY Derby, it should give him a better shot at catching the leg-weary leaders. His trainer won with his only Preakness starter, Cloud Computing in 2017. His trainer is not accustomed to running horses back in two weeks and said, ”We’re going to need to close the gap on him somehow. We’re going to need to improve. Even though our horse ran an excellent race in the Derby… he needs to again move forward and we need to have Justify come back to us a little bit.” Sounds like too many “ifs” to feel confident that his horse will turn the tables on the Derby winner.